Charles Edward Sayle – poet, bibliographer and librarian – was born 150 years ago on this day in 1864. His surname may be familiar to Cambridge residents as his father, Robert Sayle, was the founder in 1840 of the town’s most famous department store (the building in St Andrew’s Street was taken over by John Lewis in 2004). Charles was schooled at Rugby and did not attend Cambridge University, matriculating instead at New College Oxford in November 1883, and took his BA in 1887 and MA in 1890. Having returned to Cambridge he was admitted to St John’s, where he catalogued books in the fine seventeenth-century college library. He joined the staff of the University Library aged 29 in 1893 and rose to the position of Assistant Under-Librarian in 1910, in which position he remained until his death, at the age of fifty-nine, in July 1924. 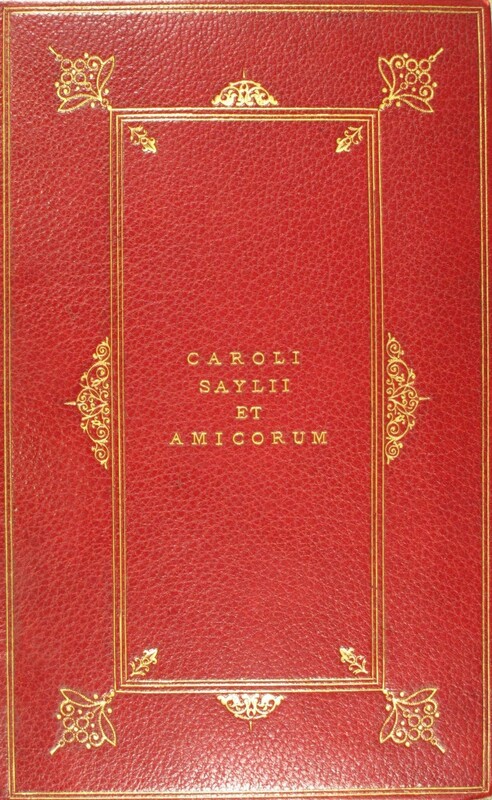 Although this post is by no means a complete account of Sayle’s many virtues and achievements, the 150th anniversary of his birth seems like a good time to reconsider his life and work, his gifts to the University Library and his impact on this university town, where he lived and worked for over thirty years. Sayle is remembered for his prolific literary output, his diary (covering most of his life and preserved in the University Library: MS Add. 8501-8510) and his encouragement of attractive young undergraduates. His first significant appearance in print came when he was still an undergraduate at Oxford. His Bertha: a story of love – verses on male friendship and homosexuality – was printed in London in 1885 and immortalised his own liaison with a fellow undergraduate which had him sent down for the academic year 1885-1886. The work was one of a number written on the uranian theme, looking back to the ancient Greek tradition – continued to some degree in England’s public school system at the time – of friendship between adolescents and older men. 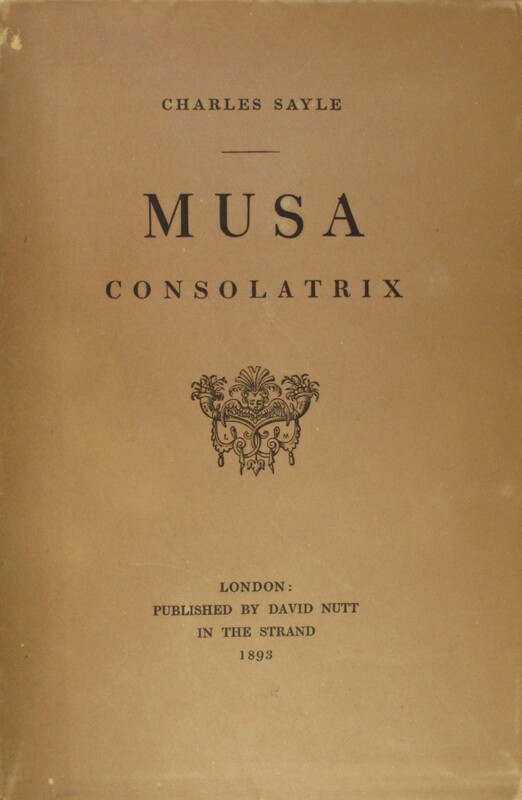 It was followed in 1889 by Erotidia (printed in Rugby) and in 1893 by Musa Consolatrix. According to A. C. Benson (in his obituary of Sayle in ‘The Library‘ of 1924) his poetry “had a certain Tennysonian grace and facility, but was singularly passionless, never going more deeply into life than to reflect a touch of the regret which even the quietest kind of happiness brings…”. The nature of these works gave a special importance to the small – and usually clandestine – social networks of their authors, networks in which Sayle began to move at this time. Other exponents of uranian literature included Montague Summers, Alfred Douglas (a lover of Oscar Wilde) and William Johnson Cory. Books played a very important role in making and strengthening connections between authors and Sayle sent copies of Bertha to Oscar Wilde himself (the current location of this copy is unknown) and to John Addington Symonds, whom he praised as the leader of the movement in his inscription. The elaborate binding (with Grolier-esque motto) on Sayle’s own copy of his “The Church of Our Lady & the English Martyrs, Cambridge” ([Cambridge]: 1890), Adv.d.119.1. In his time at Cambridge from the 1890s onwards, Sayle gathered around him at his home in Trumpington Street a number of attractive undergraduates, and often gave parties. He encouraged an interest in bibliography in new students and facilitated discussion among friends; one of his obituaries noted that “No guest was ever so diligent in contributing to talk, in setting others at ease, in selecting topics in which they rather than he might scintillate.” One of the undergraduates he encouraged was the climber George Mallory, who arrived at Magdalene College in 1905. Admired by many for his striking beauty, Mallory was introduced to many significant Cambridge figures through Sayle and Lytton Strachey, including members of the Cambridge Apostles. In March 1908, shortly before Mallory’s graduation and departure from Cambridge, Sayle presented him with a copy of Erotidia, which recently appeared for sale. The poet Rupert Brooke was another of Sayle’s acquaintances, the two having met soon after Brooke’s arrival at King’s in 1906. Like Mallory, he would die young; off the Greek island of Skyros from an infected mosquito bite in April 1915. An early favourite of Sayle’s worked with him in the University Library: A. T. Bartholomew, known to all as Theo. He arrived in January 1900 at the age of just 17, as a Second-Class Assistant and remained at the Library for his entire working life, serving from 1913 as Under-Librarian until his premature death, aged 50, in 1933. Theo loved the Library in which he worked, and became well-versed in all aspects of its management, from his mastery over Lord Acton’s immense collection in the first decade of the century to the many suggestions he made during the planning of the new University Library, opened the year after his death. Like Sayle, Theo was well-connected in uranian circles, and collected the works of many of its leading lights. He worked for many years on what would have been the first biography of Frederick Rolfe, Baron Corvo, until the project was wrested from him by A. J. 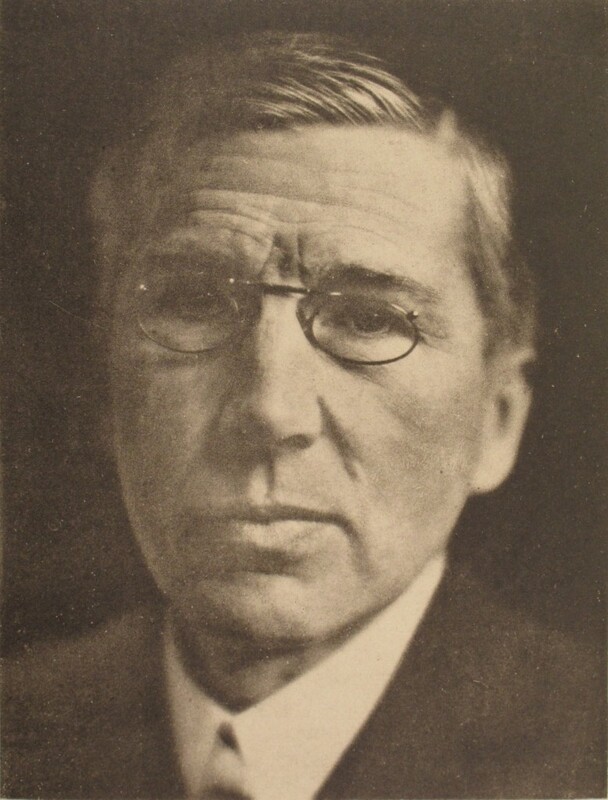 A. Symons, whose Quest for Corvo – which used much of Bartholomew’s material – appeared in 1934. Incidentally, Sayle and Bartholomew are mentioned in a recent book on Corvo – Robert Scoble’s The Corvo Cult (2014) – which includes a chapter on Cambridge devotees. Two obituaries of Sayle appeared in The Library in December 1924: one by the essayist, poet and Master of Magdalene College, A. C. Benson, and the other by the bibliographer A. W. Pollard. Of his personality Benson wrote that “He was one of most uniformly courteous men I knew” but pointed to his emotional struggle, perhaps the result of the ever-youthful University environment in which the ageing Sayle found himself. “Superficially he was regarded as a happy man” wrote Benson, “but underneath all this there ran an undercurrent of sadness and even dreariness…like one who had fallen more than once among the thorns of life.” Sayle was not alone in having such feelings; Theo Bartholomew found himself feeling ever more acutely the passing of his years while those around him – each year’s new crop of undergraduates – remained young. 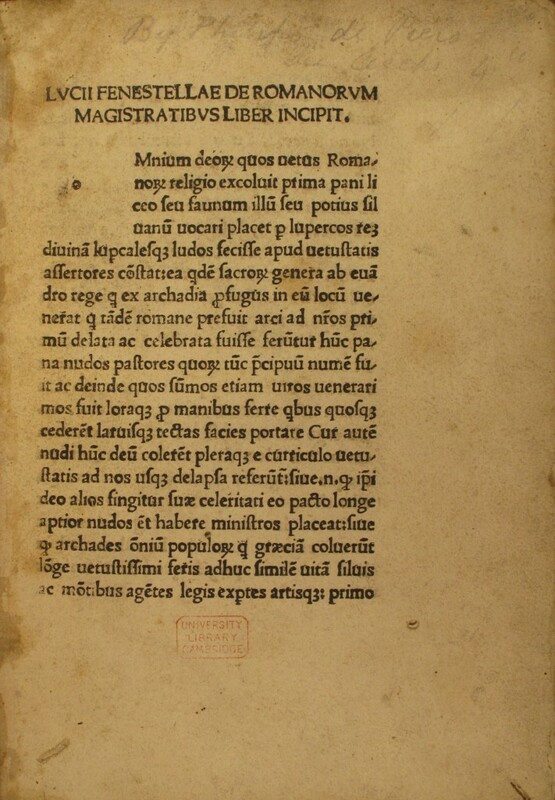 Nonetheless, Sayle was well-respected in Cambridge over the thirty-five years of his professional life here and his memory is perpetuated by his curatorial work with several significant library collections in the University, by his gifts to this library and by his qualities as a friend.